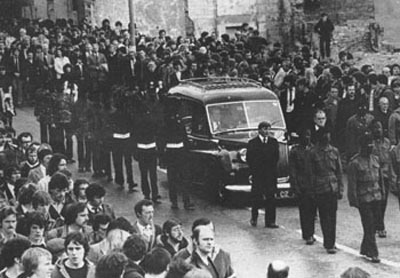 The funeral of Patsy O'Hara was one of the biggest ever seen in Derry - equalling in size those of Bloody Sunday in 1972. People had travelled from all over Ireland to pay a final tribute to Derry's republican socialist hunger striker. The funeral which went from St. Columbas Church, Long Tower, through the Brandywell, Bogside and Creggan areas to the City Cemetery, took over two hours. As the procession left St. Columbas Church led by a lone piper, it was flanked by a 34-strong INLA colour party - six of whom were armed. The cortege wound its way through the Brandywell and Bogside, through the meandering streets to the city cemetery. The route was lined by thronging people who had gathered to pay their final respects to Patsy. Such was the volume of people that the cortege took an hour to travel the first mile of its route. The route went from the Church, down Bishop Street, past Ardfoyle and the O'Hara family home to Lecky Road. It moved past the flyover which was crowded by onlookers and swung into the Bogside. It moved up the New Road and turned into the City Cemetery at the Creggan Gate. The coffin was led to the graveside by the lone piper, playing a lament. She was followed by three drummers who remained silent. At the graveside three volleys were fired by a six man firing party. 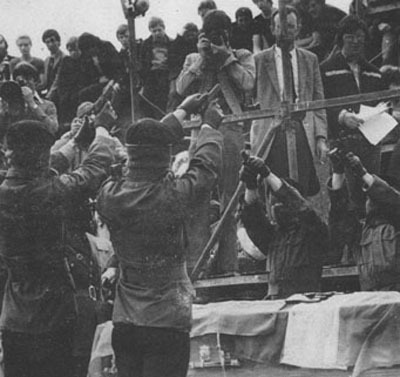 After the funeral rites, a bugler played the last post while the INLA volunteers stood to attention. Following the funeral rites, James Daly chaired the proceedings and introduced the speakers. He offered condolences to the O'Hara family and then introduced a spokesman from the Army Council of the Irish National Liberation Army, who read a statement from the army leadership. The statement castigated the Haughey Administration in the Free State, saying that it was as much to blame for the death of the hunger strikers as was Thatcher. "Our comrade did not die solely for the five demands of the political prisoners. He recognised that if the prisoners are criminalised, then the struggle for Irish freedom is criminalised. This is the reason why Patsy went on hungerstrike, and along with his comrades in death, Bobby Sands, Francis Hughes and Raymond McCreesh, courageously confronted the Thatcher regime and her loyalist lackies." "Our response will not be a wild emotional one, but a highly disciplined one. In the future we intend to better the deeds we have done in the past." The statement also paid tribute to the two INLA volunteers killed since the death of Bobby Sands - Jim Power and Matt McClarnon. It concluded by calling for the setting up of a broad front against imperialism. James Daly then introduced Patsy's brother Sean Seamus who made a personal plea for anti-imperialist unity. Then followed the oration from Gerry Roche, a member of the Ard Comhairle of the Irish Republican Socialist Party. He began by extending the party's sympathy to the O'Hara family and by paying tribute to Patsy's courage and determination, traits of caring from an early age until the end of his life. "Patsy's participation stemmed from his total opposition to British Imperial rule... In '69 and '70 he involved himself in street defence fighting to keep the RUC and British Army out of the Brandywell and Bogside". "On his emergence from Long Kesh Patsy joined both the IRSP and the INLA. For as he had matured in years he had also matured politically. From study and debate he had embraced socialism . . . not, however, the socialism of the academic textbook . . . but a socialism gleaned from relating his own ideas to the experience and needs of the people of Derry." "Patsy had seen at first hand the misery caused by imperialism and capitalism . . . the Derry of the dole queues, the city of emigration . . . the Derry of discrimination. He knew that the city's problems were caused by the twin evils of partition and native capitalism . . . and he knew how to overcome these evils. Patsy saw that it was not enough to replace British rule with that of gombeen rule . . . but that revolutionary change was necessary. "And as Patsy had learned from James Connolly in this respect. . . he learned from Connolly in others. He believed, along with Seamus Costello, the greatest practitioner of Connolly's thought in our day, that ultimately the only means that would defeat Britain was that of armed struggle combined with political action. "And Patsy was not afraid to put his ideas into action". "Patsy understood clearly the totality of relationships between the Free State and Britain being one of slave to master. . . and he was determined that this relationship be destroyed forever through the establishment of a thirty-two county socialist republic". "Caillíuint mhoi is ea é do ghluaiseacht na saoirse in Eirinn. D'oibrigh sé le fuinneamh agus dóchas ar ar son agus ár shon a mhuintire. I measc na laoch atá a ainm". James Daly then introduced Bernadette McAliskey of the National-H Block/Armagh Committee. 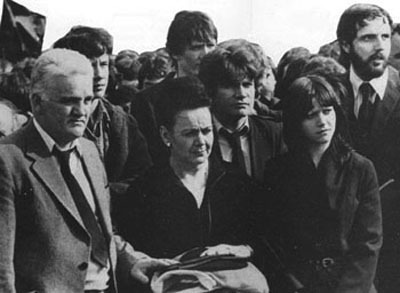 After sympathising with the O'Hara family and the families of the other three hunger strikers, Bobby Sands, Francis Hughes and Raymond McCreesh, she paid tribute to the courage of the hunger strikers. "As the cortege left the Long Tower church this morning, personally I could not help but cast my mind back to a time in 1969 when there was no ambiguity on the part of Catholic hierarchy as to the position of young men like Patsy O'Hara. When I stood in this city and young men like Patsy O'Hara were sent for because the Long Tower church was under attack and so was St. Eugene's cathedral. "And it is tragic, in this time in our history, that the Irish people, who for centuries have defended their church and their religion, should be, by and large, so sadly abandoned by it in their hour of greatest need. "But as we leave this cemetery today, let us remember the amount of work that has to be done. Let us remember that our brave young men have paid the price of their bold sacrifice. But the prize has yet to be won, the demands have yet to be gained. "So we must go out, no in a spirit of dependency we must go out, not in the spirit of demoralisation, but knowing and taking heart from the courage of those who have shown us the way that unity is our strength and that we have shown by our strategy that it is correct to stick with our single issue and build the broadest unity possible, to shame those who would not stand with us, at least in silence, and to continue to win the hearts and minds and the active support of the plain people of this country. We will show those who purport to lead it that either they lead us on the path, justice and freedom or then stand out of our way."